When an author is offered a publishing deal, it’s very important to ask what differentiates the publisher from others, what their added value is and why the author should sign with them instead of another publishing house. There is usually very big differences between getting a deal from a Top 5 publisher vs. a smaller publishing house when you’re an upcoming writer who hasn’t had a big hit before. If you’re very lucky and a big house signs you, it’s unlikely that they’ll do any promotion for your book. They’ll put it in their catalogue and will mostly hope and wait for demand to self-generate. Large publishers usually spend their advertising money exclusively on their top 3-5% of already established authors because it’s too risky for them to invest money in a new, unknown author. On the other hand, when you publish with a smaller publishing house, they’re willing to take on more risk and publish new, emerging authors, but they usually lack the funds for real advertising. They’ll try their best to do it through social media, PR and free marketing tactics. Inkitt completely changes the risk economics of publishing authors who have yet to reach their spotlight. Based on the algorithm that we have developed that analyses reading patterns, we can predict much better if a book has the potential to reach a larger readership upfront, based on crowd wisdom. This way we have the advantage to be able to publish talented authors who haven’t had their breakthrough yet and thanks to our investors, we can invest in every book launch. In many cases we have spent over tens of thousands of dollars in both pre-and post launch marketing. Just to clarify, this is an investment from Inkitt in the books and the authors receive royalties from the revenue not from the Inkitt profit. So what exactly goes on behind the scenes when we publish a book? From the moment you, the author, submit your manuscript to us, until copies become available worldwide in both digital and print – here’s everything that goes into our publishing process, how we tailor each marketing strategy to make each author’s work a best seller and give them the spotlight they deserve. 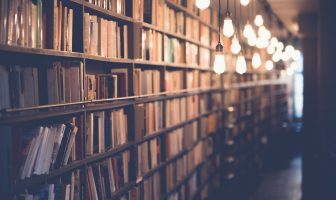 As you know, at Inkitt every book goes through an initial readership analysis in order to collect reading data to find out how hooked people were while reading, and uncover who the book’s ideal audience is. 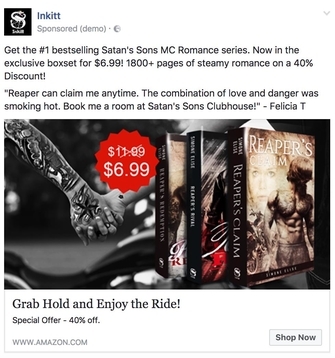 This way, Inkitt is able to identify novels that do have best seller potential, and gain crucial information about its readership, even before publication, allowing the publishing team to elaborate a very targeted marketing strategy. We work hand in hand with our authors and come up with the marketing strategies that are best suited for their books. Once we see that a novel is performing really well on the site, we contact the author to offer them a publishing deal and sign the contract. With our team of professional editors, we make sure that the manuscript is up to snuff by giving it two rounds of in-depth editing. Afterwards we have a proofreader go through with a fine comb to polish out last stains. This is the process the authors are most involved in. We emphasize the author as the chief editor. We meet with editors as consultants, they can suggest changes and ideas, but the final say remains in the hands of the author, as we trust them to know their target audience best. Same applies for the cover. We create over three different draft options of the cover for the author to pick from and run tests on how audiences react to each cover by running Facebook ads and posting them on social media. 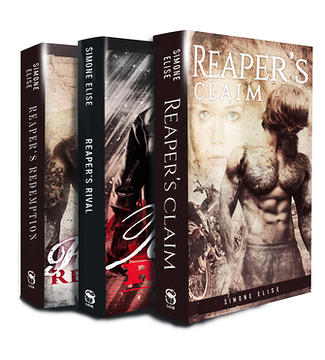 This way we can guarantee that we guide the author into the right direction to pick a cover design that will not only please the eyes of the reader, but also sell copies. Once we have the necessary content, we run ads on multiple social media networks with the goal to build up a large email list of engaged fans for the author. We are turning signups into enthusiastic fans by sending them advanced reading material from the author and the possibility to join in on special events like reading sessions and Q&A’s with the author. We maintain a network of 20,000 book reviewers, bloggers and booktubers. We select the ones that are the right match for your book, individually tailoring our outreach to make sure that your book is seen by the right audience. The goal is to get as many reviews as we can for the launch week, as it’s in direct correlation with the conversion rate of visiting to buying. We usually get for around 50-100 reviews in the launch week. We are committed to building up an author’s brand that goes beyond promoting a single book. We will help the author get set up on all relevant social channels and coach them to become a social media pro. Being a successful author is about so much more than just writing a great book (which you already have! ), it’s about accessing your fans and sharing your talent with your readers. We have a very close relationship with our authors and have regular Skype calls with them to discuss strategies and help with anything that may come up. The day where we make the whole preparation count. At this point, we have designed a beautiful cover, perfected the manuscript and built up a dedicated fanbase that is waiting for the book to launch. Now we make sure your books get as big of a spotlight as possible. By sending exclusive launch offers to the fans, we make sure that your books sail high up into the Amazon rankings. This way we guarantee that the books show up in the Amazon best seller lists and get featured by Amazon with the goal to get it in front of as many interested buyers as possible. So far 17 of the 18 books that we published became Amazon best sellers, meaning that they’ve ranked #1 in their category and a lot of them even reached top 20 or top 50 rankings among the 4 million books on Amazon. While your book is working its way up the charts on launch day, we’ll be working together to promote your brand on your established social channels, as well as Inkitt’s social pages. These promotions include hosting live readings, Q&A sessions between fans and authors, contests, and giveaways. After the launch, we are working on further building up the fanbase of the author by collecting emails through Facebook ads. Interested potential buyers can either sign up to future releases of the author directly through so called lead forms on Facebook or through sign up pages integrated inside the books. By generating a fanbase we are not only securing the longtime career of an author and sales for future books, but get the possibility to sell other items from the author like book bundles, audiobooks and merchandise, to maximize the royalties for the authors. We also try to get all of our others featured by Bookbub and advertised to their email list and are seeing really good results from their newsletters. To turn a book into an international best seller often marketing is not enough, you need to involve the press. This is why we are working together with a PR consultant at Mindbuckmedia, who previously worked at Amazon and therefore has great understanding of digital sales. Having a great PR strategy is one of the major requirements to get the books as paperbacks into top retailers and libraries. 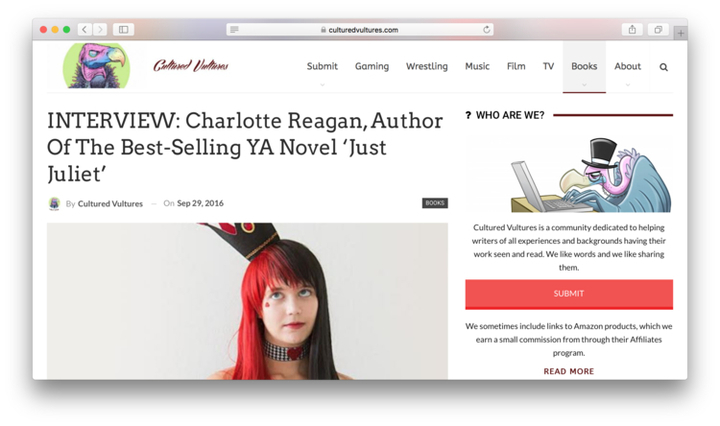 Charlotte’s first interview with Cultured Vultures, shortly after the launch of her first novel, Just Juliet. Since early May 2017, we have been building our own sales team to pitch our books to bookstores and libraries all across the U.S. and U.K and have been seeing very positive responses. Also, the first Inkitt audiobook is in the making right now and we might create more for a selection of our future books. 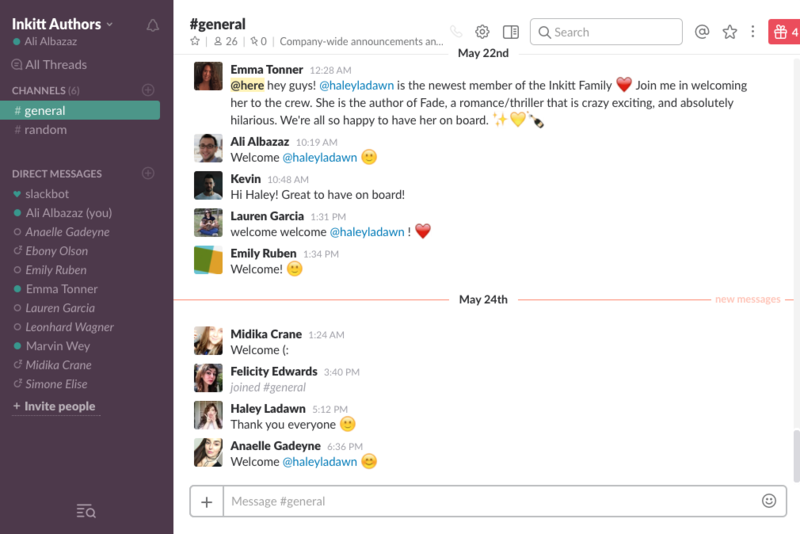 We also have a dedicated Slack channel: Inkitt Authors, where they can reach our publishing team at any time, should they have any questions or announcements. On there you’ll also find a perpetual flow of excitement, friendly exchanges and lots of shameless quotes and puns. Authors can also interact with each other, share ideas and help each other cross-promote. Inkitt is growing and improving each month and our goal as a publisher is to support as many talented authors as we can to help them reach their full potential. We believe in authors. We believe that authors can change the world. And we’re here to help make that happen. If you have any questions regarding our publishing process, feel free to comment below or shoot me an email to ali@inkitt.com. Since I posted this blog, I’ve been receiving a lot of emails from authors who want to submit their work to Inkitt. You can easily do it here: www.inkitt.com/novelcontest Thanks so much everyone, keep writing! How do I get my book onto the publisher page to lunch a finished book that I just put on facebook? How can I eventually get a real book of my published one to give to a friend and stuff like that I’d like to see a physical copy of it for my own satisfaction of knowing it was published and evenul stat maybe getting my Royalties? I really love the Inkitt application it’s dope but I would love if a more captivating horror stories are published something that would make me more scared. I have a story I named “The MTM” which is a metaphor for “The Mind Transfer Machine”. I wrote it with the idea of selling it to interested parties. The story is a good one and involves a young boy just 14 years old who was condemned to death for killing his girl friend. Of course, he didn’t do it. Circumstances deem otherwise and he spends 10 years in prison before he is rescued by a Doctor who wants his body for his own purposes. The doctor invents a mind transfer machine that enables him to replace one man’s mind with another man’s mind or essence. A good story that needs to be published. Hey Michael, thanks for your comment! It’s is great to have you and your work on Inkitt 🙂 Happy to see The Mind Transfer Machine entered in the Novel Contest like so many of our now published authors work’s were. All the best to you and your novel! I have an unpublished book and when i started the contest as seen on your site, i saw something else that i have to publish the book first. Hey Derryl! Thanks for your question. In terms of protection we have two systems in place to protect the works of authors. First, we have eliminated the possibility for users to copy paste any story from the Inkitt platform. Second we also have time stamps for everything that occurs on the platform. Therefore, if in the unlikely event that a story was shared illegally, you could prove ownership. Hope this helps. Can I submit my self published novel if its already on Amazon? Can I submit my book which has already been self-published earlier this year? Yes, Shankar, you are welcome to submit previously self-published works. We would love to have you join the community! I submitted my work, Fire At Dawn to the contest. I was wondering how the judging works. Do you folks read all of the entries or do you rely on voting from the general Inkitt readership? I was involved in another group that I won’t name that judged solely on reader input. The problem was, the input wasn’t concerned so much with writing ability as it was with the content being written about. Anyway, I’m happy to be here and hope I get to go further with Inkitt. Hello, I notice it mentions novels. However do you accept other types of books such as children’s books or non fiction? I cannot get on facebook and nor on the other web pages except on twitter. I think it is because I forget my passwords but they seem to want me to change my email address. So that can affect my sales because face book is bigger and larger and then it affect Amazon and all the rest. But then that is just me. I have submitted a book for the novel contest called “Try Not to Think” but am unable to locate it in any of the genres it was selected for or via the search function. Is there a waiting period before the book becomes “live”? It was submitted yesterday. Hi Michelle, thanks for your question. Once you submit a novel, your work makes its way to our Quality Assurance team. If any changes are needed, they will email you and let you know. Otherwise, when it’s approved, you’ll receive a notification. Without this approval, your work is not made public for the readers on our platform to enjoy. Typically it takes anywhere between 24-48 hours for our Quality Assurance team to get back to you about submissions. How do I submit my self published book on Amazon to Inkitt? You can either upload your novel to Inkitt through our website or you can send your manuscripts to support@inkitt.com and we are happy to upload them for you. I have so far published two books. These are ‘Full Circle for Mick’ and ‘For the Love of Armin’ My Twitter address is @kramercad1 – My latest work is entitled “Now What?! !” and this is a work in progress. The front, spine and rear covers have been designed and will be used. My home phone number is 61 2 6029 7164 and my cell phone is 61 428 537 995. I would love to be able to incude the cover design here, but I see no way of uploading it to your site. so, if you would like to be considered for submission to publish, then send me an email. Kind regards – Michael G Kramer OMIEAust. Hi Michael, thanks for your question. In order for your cover design to be included on our platform it needs to follow our guidelines. Please check out our guidelines page for more information. Once it follows our guidelines, you can simply upload your cover design in the story editor under “Edit Story Cover” on the top left hand. Do you do any publishing for children’s stories or are there any current writing competitions I could enter? Hey Peta! We don’t yet have contests for children’s stories, but instead have novel contest that runs every month. If you are looking for competitions to enter to submit your children’s stories you can have a look at our contest page for anything applicable to your works. I tried a download but it would not accept the pictures that support the text. How can this be corrected? Hi James, thanks for your message. I assume you are talking about submitting your novel with pictures using our importer. Currently, we do not accept novels with pictures that support the text. The only way to correct this therefore is to eliminate the pictures all together. If you need any further clarification you can contact our support team at support@inkitt.com. Hi. How do you guys decide which book is ready to be published? I mean what criteria does a book need to meet so that you guys deem it worthy of being published? Does it need a certain number of reads? Or a certain number of votes? What? The publication decision is based on reading engagement, re-engagement, sharing, and the behavior of new readers who discover a book through their friends, so the collected data bar on your analytics page will be helpful when more readers have read and completed the book too. Over the years we’ve seen books with 100 reads that had more engagement than books with 500, 1000, 10000 reads. It’s all about engagement. Once you’ve reached a high level of engagement your book will be eligible for publication. Hi – I’ve self-published my new novella already (ISBN number et al) – it’s going on Amazon and other platforms. Does that make it ineligible for you? No, not at all. You can still upload your work to our site and we will evaluate through our community. I have a manuscript of a novel in which you may be interested. It is 63,138 words in length. It is entitled ‘Spirit of Progress’. It is an alternative history of Australia, and is about the restoration of an old train, and the restoration of Australia as a nation. Hi John. You’re book sounds interesting! You can submit your work onto our platform. If you go to our website, you will see a tab at the top that says “Become a Writer.” If you hover above that, you can click “Write or Upload Story,” and that will take you to the story editor (as long as you are logged in first). From there, you can either start writing in the text box OR click on “Upload Manuscript” and upload your .doc/.docx file (make sure it follows the writing guidelines). After that, you just upload a cover picture and complete the story settings (“Settings” button on left side). Once you do that, you can submit, and then the work is on its way to our Quality Assurance team. If any changes are needed, they will email you and let you know. Otherwise, when it’s approved, you’ll receive a notification. Just make sure your book is fiction as we only accept fiction-based submissions. i would like to publish one or many of my books because art the national library they said it was risky to publish more than four books at once and that it would take me more than sixty years to publish all sixty short stories and seven novels of mine so I was hoping to publish through inkitt ,how do I go about it? You can freely upload all your novels and works to our community and get valuable feedback as well as a chance to get published. If you have any problems, reach out to support@inkitt.com and we can help you further. Does Inkitt charge me a fee to have my novel script published? thanks for your question. No, Inkitt is completely free and we can help you uploading your novel to our community. You can reach out to support@inkitt.com for further questions as well or ask in our community on the website. I wish to upload my novel. I am unaware of the least requirements of novels that your organization takes into consideration. Could do possiby tell me what those are? I would also like to know what genres you accept? And what is the minimum required length of the novel one must upload? Is there a deadline and format guideline for the contest? Will my submitting the book to the inkitt platform forfeit my publishing rights as the author? How is the limitation of readers who reserve a copy determined? Can more readers reserve a copy if I run out? What is the threshold/criteria you use to determine how you publish a book? Once you determine you like a book, how do you decide on pricing for books, marketing budget/efforts, royalties, etc? I want to be in love with this new take on the publishing industry. It’s getting a bit old, pale, and stuffy out here. Where can I view a sample of your publishing contract? Thank you for reaching out. You can review our publishing contract here: https://www.inkitt.com/contract. I’m working on a 5 book series. I have nearly 2 books finished. Should I send what I have or wait and finish book 2? That sounds amazing! Please already upload book 1 and we can help you with the uploading process. Let us know at support@inkitt.com. I would also recommend uploading the unfinished book 2 already since our reader and author community can give you valuable feedback while you write. Hi I am looking to publish my book can I have some advice on how muck it will cost to do so. Hey Naureen, thanks for your message. There are no costs associated to get published with us. We take care of it costs, as are marketing gets to work publicizing your work. However, you first need to submit your book to our platform, and more importantly garner reading engagement. The publication decision is based on reading engagement, re-engagement, sharing, and the behavior of new readers who discover a book through their friends. In that regards the collected data bar on your analytics page will be helpful when more readers have read and completed the book too, so it’s good to keep getting the word out there by using social media channels, our Groups page, etc. Hope this helps. How do I get a book published please. Any info would be appreciated. Hi Garry. Thanks for your question. To get your book published you first need to submit it to our platform. You can do that following the steps in this video. Once your book is submitted, we base our publishing decision on reading engagement, re-engagement, sharing, and the behavior of new readers who discover a book through their friends, so the collected data bar on your analytics page will be helpful when more readers have read and completed the book too, so it’s good to keep getting the word out there by using social media channels, our Groups page, etc. Also, some books take longer than others to find their audience too. Is there an age limit for the authors? Good Question! The answer is no. We do not limit talent by age. I have already submitted my work for quite sometime and both of my works have over 2000 reads but nothing seems to be happening. Is there a number of reads you have to hit to be considered for publishing? I have also submitted my works into the writing contest, but I’m not quite sure if it’s actually in it. Please let me know. This process does take time, and many of our now published authors had months of sharing and engaging new readers before they saw consistent progress. Also, the chapter reads show when someone lands on your page, but there may be readers that are still in the process of reading or could have left and may come back too. Our tech team is actually working on helping to show that information too, so stay tuned for future updates. There is no magic number. We’ve seen books with 100 reads could have better engagement than one with 500 reads. If you want to verify that your work is indeed submitted to our monthly writing contest, you can verify that in your story settings in the story editor. On the final tab of settings you will be able to see if you’re book has been submitted to our writing contest. Do you accept christian manuscripts? In general, Christian content is fine. We do focus on fictional work though at the moment. I already have 40 books published, 20 of them novels. What I need is readership, publicity, and reviews. I am willing to supply you with any number of copies for 99¢. I found that free copies are never read. 8000+ free copies I gave away of my ALEXANDER, did not yield a single review. Hence my reticence. Hey Stan! Thanks for your post. If you are a looking for readership, publicity, and reviews I would suggest you put your work onto Inkitt, where you’ll be able to share your story with hundreds of thousands of readers worldwide. The process of getting readership is simple. Engage with the community and you’ll see the favour returned. At the same time, if you want to speed up the process you can also check out our Groups section to ask for reviews for your works. I have a story collection of short stories that I’m working on. Would it be better for me to post each story as it’s finished, or submit the entire thing as a work in progress? Hi Alphonso! It’s really up to you. I would recommend to submit it as a work in progress so you can get active feedback from our community to make your work even better than it already is as you continue updating it until completion. First, great service! Second, do you guys do feed back for a story about 10,000 words long? Thanks. Thank you for the post and kind words! So, the way our platform works is our community of authors and readers provide feedback. Most authors use our Groups page to engage with others and get input at different points in their stories. If you have other questions, don’t hesitate to reach out to us at support@inkitt.com! I have a dozen novels that were self-published through Amazon’s Kindle Publishing. Kindle says that my paperbacks can be sold elsewhere, but the e-books are only available through Amazon via Kindle. Therefore, I am confused when your agents above state that self-published novels are still eligible for this program which demands both paperback and e-book sales if published? Thank you for the post! Pardon any confusion, as we’ve worked with previously self-published authors, which is why we make the point about eligibility. On our end, as long as you own the full rights to your work, you would be eligible; however, it is important for each author to look at their self-publishing company’s terms before making the decision. If you have other questions for us, feel free to reach out to support@inkitt.com. I just looked at your winners of 2017 and they are all current, young adult, sexual, vampire, romance, and werewolf themes. My novels are all Noir from the forties which transport one back in time to the Mafia in the five Boroughs of New York, the Golden Era of Hollywood and World War II, involving tales of mystery, romance, suspense, and war. Therefore, it appears that I would be wasting my time with your genres. Thank you for the post! While there are certain books and genres that can be more popular, we have a wide variety of novels and are continuing to add more every day. Our goal is to be a resourceful community for authors and to provide an opportunity for books to be discovered that may not have the chance otherwise. You’ll definitely be able to engage with our community and get feedback, so we hope to see your work on the platform! The green analytics bar for my novel is full, but I have received no information from Inkitt in regards to publication. Should I expect an email accepting or denying my novel for publication? Is there anything else I can do at this point? Thank you for the post! Our publishing team would reach out if there is an opportunity. We are a small team, so it currently is taking longer for our publishing process, but we hope to decrease that turnaround time as we continue to grow. Keep doing what you have been in terms of promoting the story, since are continuing to add new readers every day, and if you have any other questions, feel free to reach out to us at support@inkitt.com. Hello, My name is Stacy Thowe and I have my novel “God Bless the Broken Road” on Inkitt and I entered the contest. I haven’t seen any postings for winners in 2018. I believe your procedure is that once you enter a contest you are automatically reentered for future contests. Are the winners for 2018 being posted? I am getting a steady response from reader’s but have heard nothing from Inkitt and can only find winners from 2017. Can you tell me how I am doing and how long I have to wait for a response from Inkitt, please. Also should I be looking elsewhere for listing of 2018 winners. And am I able to pull my novel from site at any time? Thank you so much. Thank you for the post! The process takes a few months from the close of submissions, but yes, our publishing team is taking longer at the moment, so we will update the page as soon as possible. Unfortunately, our team size is small, and we are looking to continue growing and shortening the publication selection timeline. Your book has done well in terms of the reader data collected, so definitely continue to do what you have been doing, since we are still adding new readers every day. Our publishing team will reach out if there is an opportunity, and also, authors can pull their novel from the platform at any time, but of course, the data would then be unavailable too. If you have any other questions, feel free to reach out to us at support@inkitt.com. Hello, my name is Tabatha Sims and I am currently writing two novels, Dragon Bound and Death Mask. Should I complete these works before submitting them or can I submit them as I complete each chapter? This is my first time doing something like this so I’m a little lost. Thank you in advance for any advice and assistance you provide. Thank you for the post! You can do either, as we have authors who submit completed novels and also works in progress. If you have any questions about this, feel free to reach out to us at support@inkitt.com. Thank you for the post, and welcome! You can submit a finished book or a work in progress, as we have authors who do both. If you have any questions about this or anything else, feel free to email us at support@inkitt.com. My name is Evgenie and I have a question. Does the book must be of a specific length, to be published or at least considered for publishing? Maybe there is a minimum\maximum number of words, pages or anything? There is no maximum level of words. For the minimum it needs to be of novel size, so between 20,000 and 80,000 words, but as I said it can also be 120,000 or 250,000 words if you’d like. I should’ve known since you don’t publish a phone number where I can call you.